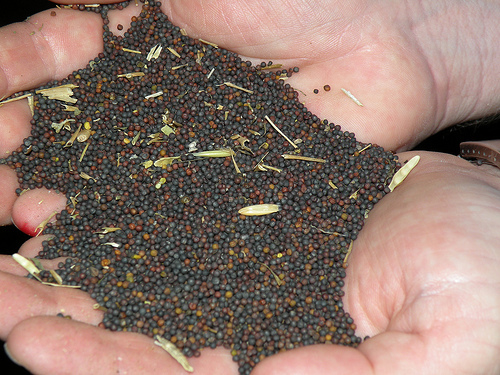 As the planting window for winter canola draws ever closer, John Stotts, seed and agronomy advisor for Winfield Solutions and Croplan, says it’s time for producers to be selecting their seed and booking their orders. He says producers have been pleased with three canola varieties offered by his company: HyClass 115W, HyClass 125W and HyClass154W. “One-fifteen is probably the best for the first-time canola grower. It’s really forgiving. It tolerates low pHs where guys can’t afford to lime on rent ground, that kind of thing. You’re going to give up a little bit of yield potential. “One-twenty-five is a little higher yielding, doesn’t handle no-till quite as well as 115. “And then 154 is going to be seven, eight days later than the 115 and 125. It’s a full season maturity. I want to push it the latest we can on the planting window. “So, if you’re starting in the middle of September, start with the 115 and 125. And the last day that you can, plant the 154. Stotts suggests producers planting the hybrids pay close attention and limit their fall nitrogen applications. Stotts estimated that the number of canola acres in Oklahoma may be double the number from last year. So far, he said, seed supplies are holding out, but stocks of Croplan’s HyClass115 are starting to get a little tight. You can see today's conversation with John Stotts on CanolaTV by clicking on the play button in the video box below. CanolaTV is a service of PCOM, Producers Cooperative Oil Mill- click here to learn more about how they serve cotton and canola producers across the south.